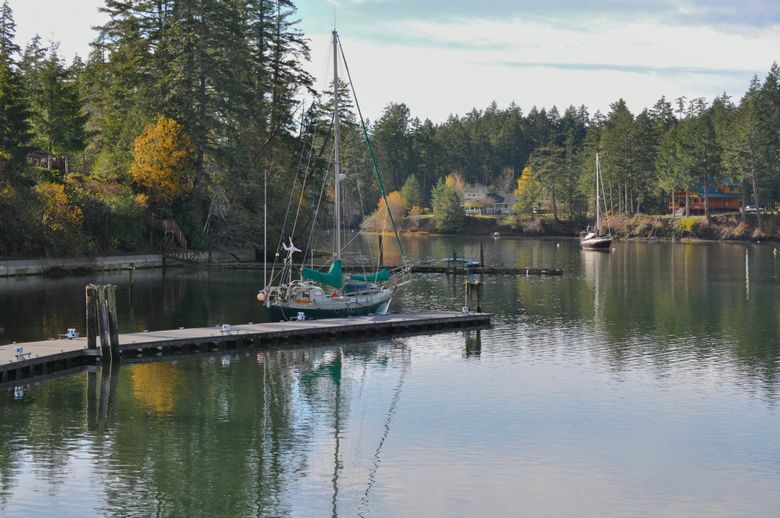 This pretty off-the-beaten-path island in South Puget Sound might be just the remedy for whatever gives you the blues. HARSTINE ISLAND, Mason County — The gentle, rhythmic sound of waves rolling over the beach was therapy to the soul. Just offshore, a harbor seal broke the glassy water and curiously eyed my family. I noticed the smell of briny sea air mixing with the loamy forest, and for a moment all was right with the world. My family had been through a stressful period last November. There are times when life throws overwhelming stress, loss or grief at you. If you’re like me, those are the moments when you fantasize about running away to an island. Through accident and a little bit of luck, we found our place of Zen on Harstine Island in South Puget Sound, near Shelton. If you’ve been fired from a job, dumped by someone you love or otherwise put through an emotional wringer, rural, off-the-beaten-path Harstine is an unheralded escape full of rich natural wonders serving as a reminder that life can be pretty great after all. Early spring is an ideal time to explore an enchanting island. Before the rest of the Northwest wakes from its winter slumber, and while snow is still falling in the mountains, sea-level locations are rich with interesting sights. Like many local places, 18-square-mile Harstine Island got its name from the Wilkes Expedition that explored Puget Sound in 1841. It was named for another mariner, Lt. Henry J. Hartstene (the spelling of his name seemed to vary through his life). From 1922 to 1969, a ferry operated by Mason County crossed Pickering Passage to link Harstine Island to the mainland. The ferry was replaced by a bridge in 1969. We found our getaway by searching our atlas for promising islands and cross-referencing them with Airbnb listings, choosing a waterfront retreat near Harstine that boasted of alpacas and U-pick shellfish. Our hosts use their B&B much of the year to house troubled teens involved in nature-based therapy work, and their property was alive with animal life. Our toddler didn’t need toys to keep him busy — he had cuddly cats and a rambunctious dog, plus a herd of inquisitive alpacas roaming the grounds. In the early mornings we visited the hen house to collect warm eggs from the nest. 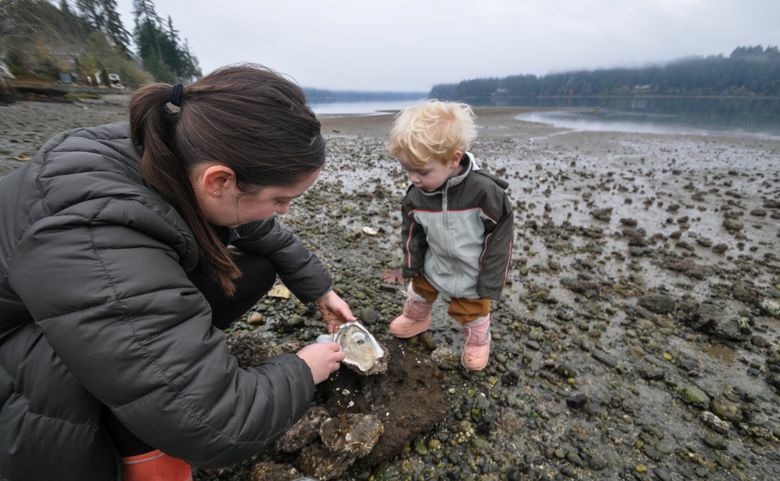 At low tide we foraged the oyster beds just steps from the front lawn, shucking oysters with screwdrivers and showing our son how to shoot them on the spot like a true Northwest kid. It’s pretty easy to realize how good life can be after a breakfast of fresh sticky buns. The Olympic Bakery & Deli (olympicbakery.com) is only a few minutes from Harstine and can claim some of the best pastries, pies and cinnamon rolls in the state. We loaded up on fresh coffee and gooey goodness then crossed the bridge to Harstine Island, where a wooden sign advertised a year-round farmers market. Maybe it was the caffeine or the sugar rush, but I instantly felt we’d arrived at a wholesome, idyllic community, and that feeling stuck with me wherever we went. We cruised the shady country lanes that would be perfect for road biking. Every few minutes we glimpsed the gnarly shores and tranquil bays studded with evergreens, making me wish we’d brought our kayaks. At Jerrell Cove State Park, on the north tip of the island, we meandered with our 3-year-old along the coastal trail looping the campground. We listened for bird songs and stopped to examine every frog and slug that crossed our path. When we’d had our fill of walking, we explored the park’s jetty, finding simple pleasure in tiny fish darting beneath the dock and the squawk of startled blue herons. The Wild Felid Advocacy Center on Harstine Island is a sanctuary for cats — but not just common household cats, we’re talking exotic meat-eaters like leopards and cougars. The center (wildfelids.org) opened in 2010 for cats that grew too big for their owners or were injured or orphaned. The nonprofit is run by volunteers who offer guided walks around outdoor enclosures housing 12 exotic species, including a 300-pound Siberian tiger, along with lynx, African serval and a chattering, six-pound Geoffroy’s cat named Mouse. Tours last between one and two hours, and the feeding tours are especially popular because you can witness more than 40 cats devouring their lunch. We spent our final day on the island exploring Harstine Island State Park, where we discovered a microcosm of regional ecology. Lush ravine trails were crammed with moss-coated cedars and firs. Locals told us that foxes are frequently seen, and while they remained hidden, mushrooms were flourishing. The park has a really good growing medium for mushrooms, especially for chanterelles, says Park Ranger Mischa Cowles. Like the forest, the park’s shoreline is also rich with edibles. Cowles says the tidelands include public shellfish beds yielding oysters, butter clams, geoducks and horse clams. We busied ourselves beachcombing, clamoring over fallen trees, and looking for sand dollars and tiny crabs. Along a steep section of bluff, we discovered huge chunks of clay that had fallen onto the shore. We broke off pieces and set to work molding them into little bowls and snakes. That’s when the seal made an appearance. They were simple activities. Tickling the soft caps of mushrooms, overturning beach rocks and shaping the clay with our hands. But those simple acts were reminders of an uncomplicated world. For a brief reprieve, we were consumed by natural joys of beach, seals, mossy trees and clay snakes. Sometimes you just need an island. Harstine Island is about a two-hour drive from Seattle via Interstate 5 and the Tacoma Narrows Bridge (Highway 16 and other connecting routes). Plans are underway for a new park just south of Harstine Island State Park at Fudge Point. Fifty acres of upland forest and sandy beach were purchased from private owners through the Trust for Public Land, and rangers are offering early glimpses through organized community hikes. To schedule a visit, call 360-426-9226. The Wild Felid Advocacy Center can be visited with advance booking. www.wildfelids.org. A Discover Pass is required for car access to Harstine Island’s state parks.